Folk style and at the same time elegant result for this colorful headband , worn on the top of the head. They are made with new materials , Chinese blue & green cloisonné enamel beads with floral motif , spacers and beads in gold metal with colored rhinestone , colors are chosen to be in harmony with the embroidered silk . Rayon tassel , deep blue , to finish the pendants . Length pendants : 8.25 inch / 21 cm. 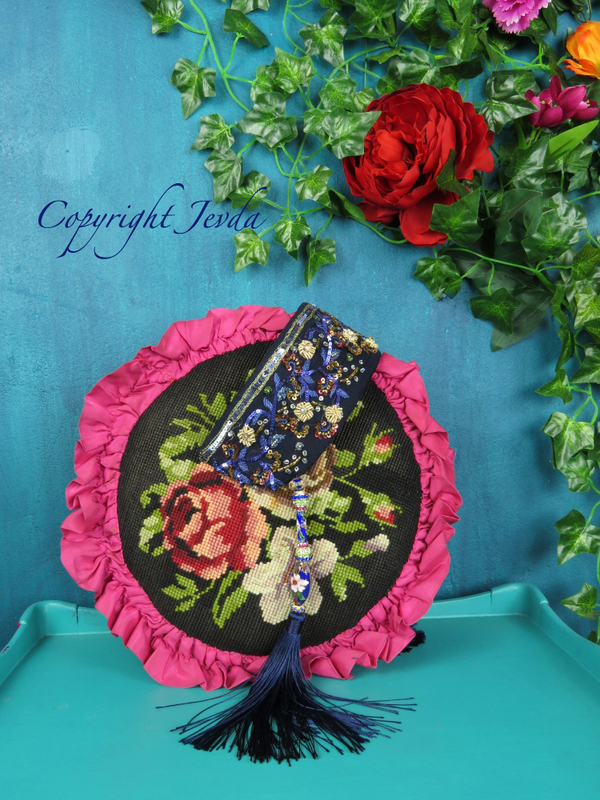 The fabric I used to create this headpiece is a recycled deep blue silk veil , flowers motif , embroidered as a jewel with blue silk threads , blue sequins , red sequins , pale gold metallic threads , gold glass beads , gold sequins , green sequins , transparent glass beads , silver sequins . Lined with up-cycled silk , printed flowers , in deep blue , pink , green and gold shades.